Kill Switch vs Kill Switch? How does Imi Statue + Unwinding Clock interact? (2), Tap: Tap all other artifacts. They don't untap during their controllers' untap steps as long as Kill Switch remains tapped. Intruder Alarm + Kiki-Jiki, Mirror Breaker + any non-legendary = infinite hasty creatures. Tangle Wire might be useful and Kill Switch . 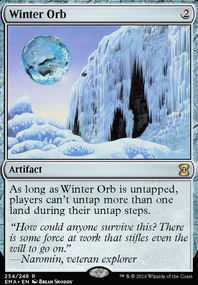 Clock of Omens can tap down Winter Orb / Static Orb to prevent your lands/permanents from being tapped. 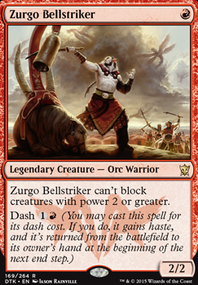 Urborg Justice oh you just played In Garruk's Wake esc card I'm taking you down with me. Kill Switch holy crud the breya ramp is getting to fast ...HIT THE EMEGENCY STOP QUICK!!! Mana Maze oh that's evil star especially since I'm using it in eldrazi decks with devoid cards wich is a loop hole around this. Once a upon a time someone just cast Wrath of God esc card then all the sudden I play Natural Affinity then after resolve I cast Eerie Interlude or Teferi's Protection and either resolve every one surrenders and possible a table flip happens because now it sweeps the lands and creatures excepts mine the end. 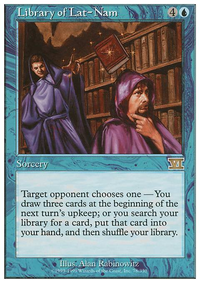 Sages of the Anima and this isn't a Animar staple because? Balancing Act is that what I... IT IS!!! A LOOP HOLE OF PLAYING Balance !!! Propaganda, Thought Vessel und Baral, Chief of Compliance habe ich auf deine Empfehlung mal dem Maindeck hinzugefgt, ebenso wie Stasis, Overburden und Kill Switch. Commandeer vs. Aethersnatch: Ich mag die alternativen Kosten bei Commandeer, deshalb bleibt die Karte drin. Time Warp und Konsorten wren natrlich ultimativ auch echt gut in dem Deck, allerdings blhen die das Budget natrlich auch gleich ziemlich auf. Das ist dann aber auch gleichzeitig der einzige deiner Wackelkandidaten, der mir zusagt. Angel's Trumpet EDH rec has it in 410 decks. Nice aggro-centric/anti-control card. Kill Switch 187 decks. 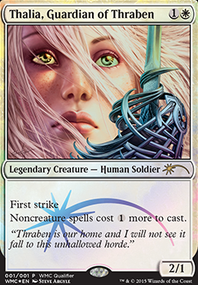 Troublesome Breya, Etherium Shaper or Sharuum the Hegemon deck? Drop this, HOSED! 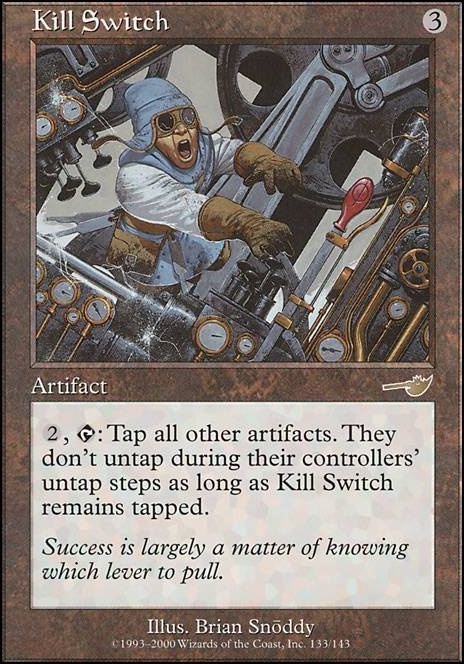 Just in all curiosity have you considered the idea of adding Kill Switch, when playing the Mycosynth Lattice, second main phase tap kill switch, make everyone's stuff tap on your turn untap everything,(as kill switch untaps on your turn so does everything else you have) play your turn, tap kill switch, and lock others out of the game. 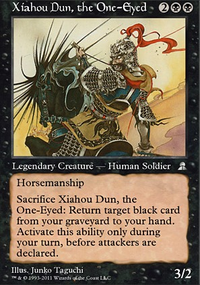 If you're interested in any more stax effects Damping Engine can be fueled entirely by Ragavan once you take the lead, worst case scenario can sacrifice itself. 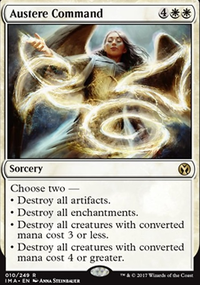 Price of Glory combined with your War's Toll (occasionally Tectonic Instability) will keep counterspells, Cyclonic Rift, and Seedborn Muse at bay. 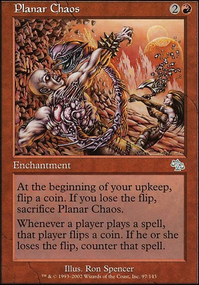 Im sure you've already considered Blood Moon but Planar Chaos is all but forgotten these days and does a fantastic job at keeping spells at bay and Torpor Orb can shut down most things while only stopping your own god and tremors triggers. Kill Switch can shut down artifact heavy metas while also being another method of manipulating your orbs. Portcullis can also be backbreaking in a stax shell. Ragavan can also be used to fuel a Helm of Possession as well.